"They're a great football team. We knew that coming in," said Filkins, who scored TDs on runs of 11, 18, seven and 64 yards. "They're physical, tough, they run the ball well and pass the ball well. They're dangerous, but we just focused on us, focused on getting better each week and it paid off." "I personally know a lot of guys on their team so I was really excited to be able to play on the same field as them and grind it out," said Lake Oswego senior lineman Ryan Bertelsen. "It was a lot of fun, a lot of fun." The win — top-ranked Lake Oswego's fifth straight— guaranteed the Lakers the Three Rivers League title, lifted their TRL record to 5-0 (8-1 overall) and set the table for another run at a Class 6A state championship; the Lakers lost in the state semifinals a year ago. "We've just got to go game by game," said Lake Oswego senior linebacker Bryson Breeze, the reigning TRL Defensive Player of the Year. "Our coach said we are guaranteed one week and that's all. We've got to focus on next week and take it game by game." "It's just about playing like we've been playing, getting better each week," Bertelsen said. "It's kind of focusing each week like Coach (Steve) Coury said." On their side of the field, the No. 11 Pacers saw their four-game winning streak snapped, fell to 3-2 and a third-place tie with West Linn in the TRL, and dropped to 6-3 overall. Despite the loss, the Pacers reveled in their comeback effort — they cut Lake Oswego's lead to 21-14 in the third quarter — and their best season in five years. "We knew in our hearts that we would come back and fight some more so that's what we did," said Lakeridge senior wide receiver Andre Martinez, who finished with four catches for 33 yards. "Our goal was to beat LO, but this time, we just didn't do it. We are going to study the film, see what we did wrong and we've got our first playoff game next week." "We got punched in the mouth the first half," said Lakeridge senior linebacker Jackson McGinley, who recovered a fumble in the contest. "It was a problem because half the team would do their job and half the team wouldn't and they ended up scoring off that. But I think in the second half, we definitely turned it up. We punched them back." To see the complete Class 6A playoff bracket, click here. 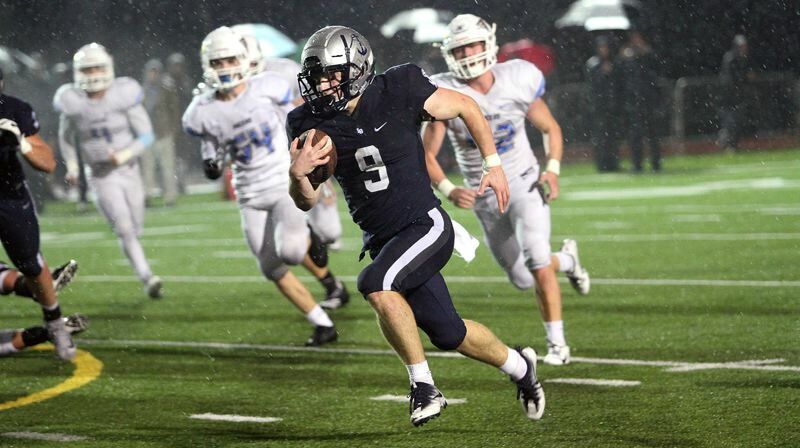 After a scoreless first quarter, Lake Oswego scored the night's first touchdown when Filkins went off-tackle for 12 yards and the TD on the third play of the second period. Along with Diyar Dezay's extra point, Lake Oswego led 7-0. After the Lakers forced a Lakeridge punt, the Pacers answered with a stop of their own — an interception of LO senior quarterback Jackson Laurent by Pacer senior Jared Bartunek — only to see the pick wiped out by a penalty. Two plays later, Filkins took a direct snap from the wildcat formation and went 18 yards up the middle to make it 14-0 with 7:33 left in the half. Things got worse for the Pacers before they got better, too. On LO's next possession, the Lakers drove 68 yards in 5:04 and 11 plays to score again, capping their drive on Filkins' 7-yard TD run over the left side to make it 21-0 in the final minute of the half. The third quarter offered more excitement, with Lake Oswego's stadium lights going out two minutes into the period and play not resuming for another 25 minutes. And when the two teams returned to the field, Lakeridge stepped up to take the momentum. The Pacers drove 77 yards for their first score, with senior quarterback Charlie Maynes completing 4 of 5 throws for 61 yards, then racing 14 yards to paydirt and bring his team within 21-7 with nine minutes left in the third quarter. "After they scored the first touchdown in the second quarter, we kind of lost it," said Lakeridge senior linebacker Javier John. "But we got it back in the second half. It's just the small things that get in the way sometimes." Lakeridge kept coming, too, stopping the Lakers' next possession after one first down and — following a bad snap that short-circuited a Lake Oswego punt — taking over at the Laker 35-yard line. Four plays later, junior running back Jalen John went around the left end and sped 23 yards down the sideline to score. After a Max Chandler PAT, the Pacers had moved within 21-14 with 5:37 to go in the third quarter. The Lakers answered like champions, however, coming back with an 84-yard touchdown drive that saw Filkins go left on the sixth play of the series and rip off a 64 –yard TD to make it 28-14 with 2:08 left in the third. "I can't even begin to explain how well our line did and how well they've been doing all season," Filkins said. "I credit my entire performance to them. They were getting pushes on every play and the holes were open and I was able to find them and make some cuts. They played incredibly. I credit them with the whole game." This time, however, Lakeridge could not respond. The Lakers got stops on each of the Pacers' next two possessions, then notched a safety with 1:25 left in the game to push their lead to 30-14. Lakeridge recovered an onside kick following the safety, but ran out of time at midfield and saw the Lakers walk away with the 30-14 win. "Luck is a combination of both hard work and opportunity and I think we'll work harder next time," McGinley said. "I absolutely think we are going to hang around for a while (in the playoffs). This team, this is a very strong team." "Every year, we look forward to the crosstown rivalry," Breeze said. "Only one team can own the lake. This year, especially, we knew that it would be a tough game, Jalen John and all them. We came out prepared, and thank goodness, we played our best." For the game, Laurent went 5 of 11 passing for 48 yards, with Filkins catching three passes for 31 yards. For Lakeridge, Jalen John carried 25 times for 174 yard and one TD, while Maynes went 10 of 18 passing for 84 yards, with Martinez leading Pacer receivers.